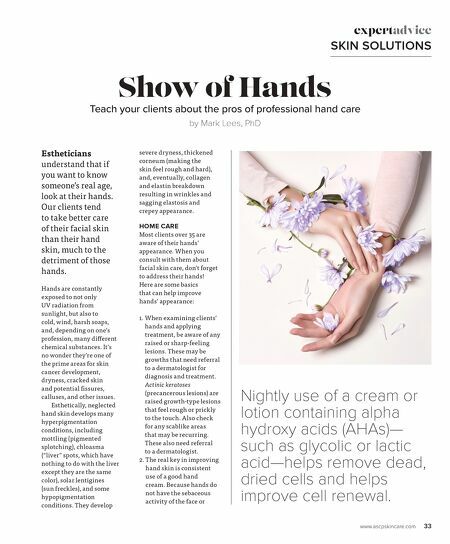 www.ascpskincare.com 33 Show of Hands Teach your clients about the pros of professional hand care by Mark Lees, PhD expertadvice SKIN SOLUTIONS Estheticians understand that if you want to know someone's real age, look at their hands. Our clients tend to take better care of their facial skin than their hand skin, much to the detriment of those hands. Hands are constantly exposed to not only UV radiation from sunlight, but also to cold, wind, harsh soaps, and, depending on one's profession, many different chemical substances. It's no wonder they're one of the prime areas for skin cancer development, dryness, cracked skin and potential fissures, calluses, and other issues. Esthetically, neglected hand skin develops many hyperpigmentation conditions, including mottling (pigmented splotching), chloasma ("liver" spots, which have nothing to do with the liver except they are the same color), solar lentigines (sun freckles), and some hypopigmentation conditions. They develop severe dryness, thickened corneum (making the skin feel rough and hard), and, eventually, collagen and elastin breakdown resulting in wrinkles and sagging elastosis and crepey appearance. HOME CARE Most clients over 35 are aware of their hands' appearance. 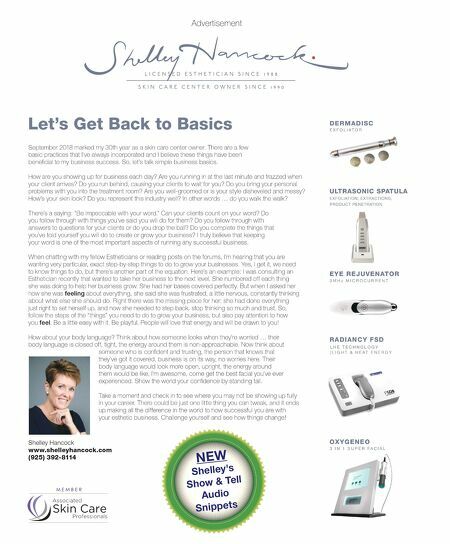 When you consult with them about facial skin care, don't forget to address their hands! Here are some basics that can help improve hands' appearance: 1. When examining clients' hands and applying treatment, be aware of any raised or sharp-feeling lesions. These may be growths that need referral to a dermatologist for diagnosis and treatment. Actinic keratoses (precancerous lesions) are raised growth-type lesions that feel rough or prickly to the touch. Also check for any scablike areas that may be recurring. These also need referral to a dermatologist. 2. The real key in improving hand skin is consistent use of a good hand cream. Because hands do not have the sebaceous activity of the face or Nightly use of a cream or lotion containing alpha hydroxy acids (AHAs)— such as glycolic or lactic acid—helps remove dead, dried cells and helps improve cell renewal.